The "Horns" set is popular these days, and here are several plays that start out of the Horns set. 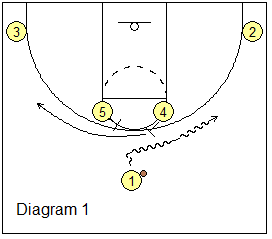 Also see many more plays and options at Lason Perkins "Horns Offense". 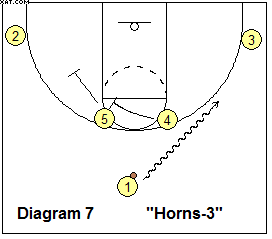 The basic Horns set has two high post players O4 and O5 (the "horns"), O1 at the top, and shooters O2 and O3 are deep in the corners. This horns play was used by coach Del Harris when he was with the Milwaukee Bucks. Starting with the box-set in diagram 1, O4 and O5 step up to the arc in a horns set. O1 could dribble either way, but since O5 is our best post scorer, O1 goes right off O4's screen. O3 and O2 set a staggered double screen for O5. O5 cuts around the screens for the pass from O1 (diagram 2). If O5 is not open, O4 down-screens for O2 (diagram 3). O2 cuts to the top for the pass and 3-point shot. 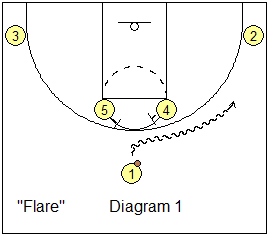 This first play comes from Minnesota Lynx (WNBA) Head Coach Cheryl Reeve. 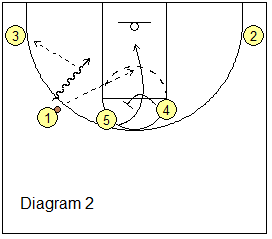 This play starts with the Horns set (diagram 1) and could be run to either side, depending on the first dribble. Here, O1 dribbles left. Very importantly, O1 dribbles high and wide to maintain good spacing. 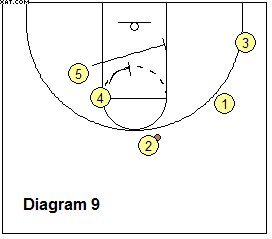 The ballside corner O3 cuts off a downscreen from O5, and cuts all the way to the top to fill O1's vacated spot. Diagram 2 shows O1 passing back to O3 on the top. O5 shapes up to the ball and steps out to get the pass from O3. The rule is that O3 must pass to the ballside high post player. The opposite post O4 slides out a little for spacing. As soon at the pass goes to O5, O2 cuts hard inside for the pass from O5. It could be that O2 may have to post up the X2 defender, and O5 makes the hi-lo pass to O2. Coach Reeve points out that the X2 defender is not usually accustomed to playing inside post defense, and O2 has a good chance to score here. Notice that we have a counter (diagram 3) if O3's defender goes over the screen to deny the pass to the top. O3 simply pops back for the pass from O1 and the open shot. 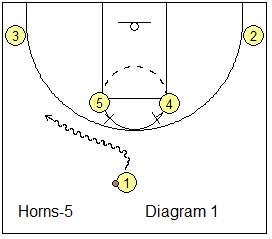 Using the Horns set, O1 is point guard, O2 and O3 start in the corners, and O4 and O5 are at the high post spots. 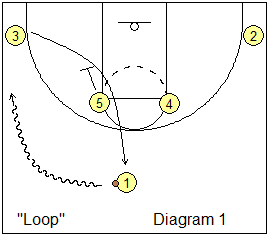 This play can be run in either direction, and the first pass determines the direction of the play. Here we run it to the right side as O1 yells "Go" and O2 cuts to the wing to receive the pass from O1. 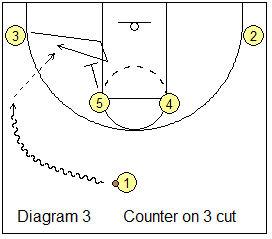 The ball-side post (O4) immediately screens for the opposite post (O5) to make spacing for the cut by O1. O1 makes the basket cut, looking for the pass from O2, before moving out to the opposite corner. O3 rotates to the point. On the O4 screen, O5 delays until after O1 has already cut through (if O5 cuts too soon, O1 and O5 might collide, with no spacing). After O1 cuts through, O5 cuts hard off the screen to the ball-side low block, looking for the pass from O2. O2 has several options: pass to O1, pass to O5, shoot the 3-pointer, or drive. If O5 does not receive the pass, he/she can optionally backscreen for O2. 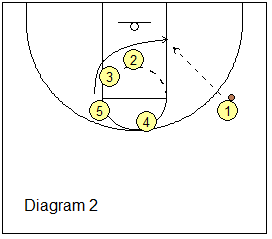 This play comes from coach Roy Rana, Ryerson University Head Coach. Get his DVD "Winning the Game within the Game: Special Teams Play for Basketball." 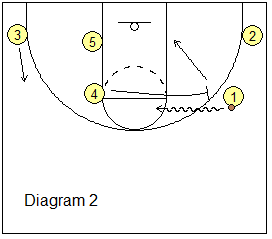 This play is useful when we are looking for an open 3-point shot. 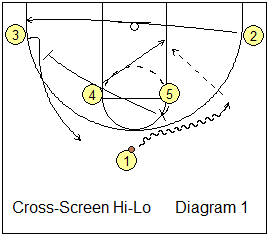 It starts with the "Horns" set and uses three double-staggered screens for a sequence of three possible 3-point shots. 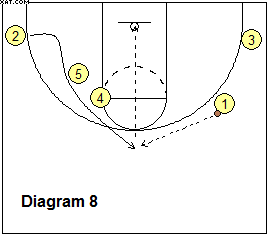 This simple horns play is designed to get the ball to O5 inside. In diagram 1, O1 dribbles off O5's horns-screen to the left. 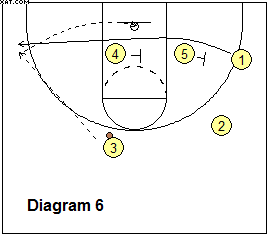 O4 screens for O5 and O5 cuts to the hoop for the pass from O1. 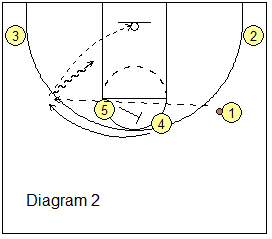 Optionally (diagram 2), O1 could dribble-drive to the hoop with a kick-out pass option to O3. 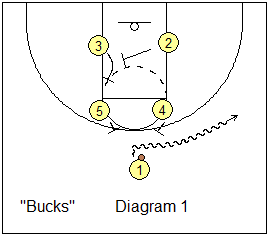 This simple horns play is good if O4 is a good shooter/scorer. Oftentimes the simple plays work the best. O1 dribbles right off O4's horns-screen (diagram 1). O5 flare-screens for O4, and O4 cuts over this screen to the left wing and receives to over-the-top skip pass from O1 (diagram 2). 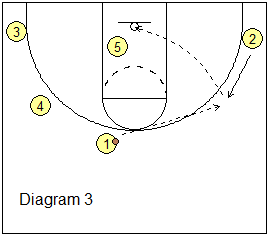 O4 could shoot the 3-pointer or dribble-drive to the hoop. Diagram 1 shows O1 dribbling to the right wing off O5's horns-screen. O4 dives to the ball-side block and could get the pass from O1. After screening for O1, O5 sprints over and screens for O3, and O3 cuts to the top. O2 runs the baseline to the opposite corner. Diagram 2 shows O1 passes to O3 on top, as O5 cross-screens for O4. O4 cuts under the screen to the left block. O5 seals the defender and "shapes up" to the ball for the hi-lo pass from O3. 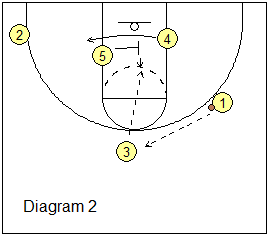 This is another simple horns play with two ball-screens. O1 dribbles right off O5's horns-screen (diagram 1). After screening, O5 clears to the opposite low block. 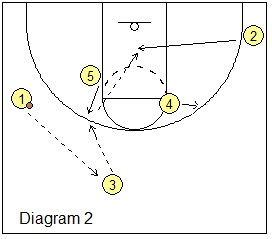 O1 keeps the dribble alive, turns and accepts a second ball-screen from O4 (diagram 2). O1 and O4 run the pick and roll. O3 finds the open window on the left arc for a possible kick-out pass from O1. 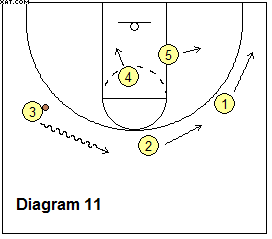 The Phoenix Suns ran this simple Horns play. 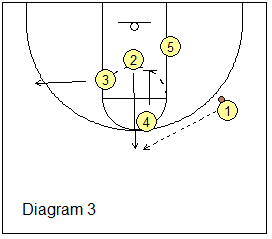 Using the Horns set (diagram 1), O1 dribbles right off O4's screen. O4 moves over to the left wing. 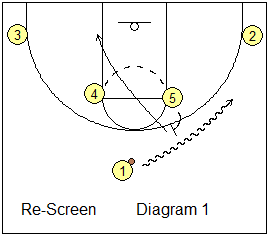 O1 reverses direction (diagram 2) and dribbles over O5's screen. 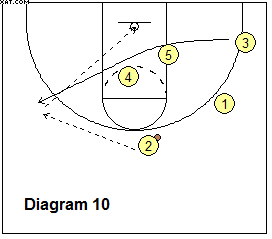 After screening, O5 cuts to the hoop for a possible pass from O1, as O2 lifts up to the wing. 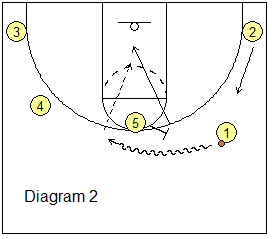 O1 passes to O2 for a 3-point shot (diagram 3). with Fran Fraschilla, International Basketball Analyst for ESPN.